This takes place on Friday 4th November 2016 7:00pm (for 7:30pm) Ramada Plaza Hotel, Shaw’s Bridge, Belfast. Lounge suit. £60 per person. Tables 10-12 people. This event will be used to raise funds for a second drill rig for the ‘Water of Life’ project and drilling water wells in memory of Mike Riddering who was killed in the terrorist attack in Ouagadougou on Friday 15th January 2016 along with 29 others. We would like to drill wells for the people Mike worked with, in his memory. Each well costs £5,000 and 100% of the money raised will go towards this worthwhile cause (nothing is deducted for administration). Jim McCann, Mark Collier, Drew Johnston, and Stephen McIlwrath (NTM missionary, from Coleraine, who is based in PNG) packed the second of 3 containers that are being shipped out to PNG. Friends in Action wish to express sincere thanks to Kilbride Cyclists for their charity cycle that was held on Saturday 6th June to raise suport for both Christian Aid and Friends in Action. Over 100 cyclists (including FIAs Tim Wilson) turned up on a very wet day to complete either a 45km cycle, or a 90km cycle. Both routes started from Kilbride Presbyterian Church and headed to Broughshane via Moorfields. The shorter route returned Kilbride by the Collin and Ballinashee; the longer route wound its way to Glenarm (where a much appreciated cup of tea and sandwichwes were waiting), before heading down the coast road and returning to Kilbride via Carncastle, Kilwaughter, and Ballyeaston. The event was very well organised, and was enjoyed by all participants - even though we all got soaked to the skin! 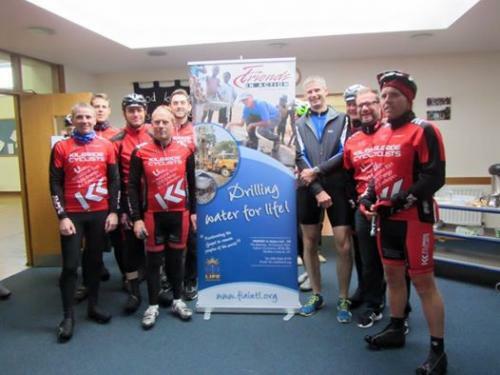 Many thanks are due to Kilbride Cyclists for organising the event, with special mention to the club secretary David Hoy. Friends in Action wish to express sincere thanks to Ballymena Gospel Male Voice Choir for the extremely generous gift to the work arising from the offerings collected at the Male Voice Choir weekend 25th and 26th April 2015 at Ballee Baptist Church". Mike McClean represented FIA at the meetings and commented: "What a thrill it was to listen to male voice choir singing at its very best and of course all the pieces focused and gave honour and glory so beautifully to our wonderful Lord and Saviour Jesus Christ. The choir was celebrating its 70th anniversary and the festival was superbly supported with large numbers attending from far and wide". Many thanks to the Choir Secretary Leslie Lynn and Assistant Secretary, David Campbell and indeed to the Pastor and Leadership of Ballee Baptist Church for the warm hospitality and superb donation.